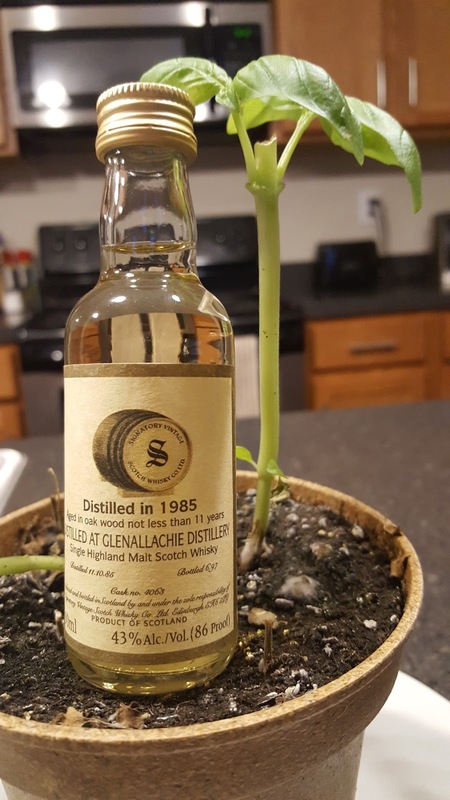 My first Glenallachie review, Woo-hoo! I guess I should say something about the distillery to celebrate the occasion. The distillery's name means "Glen of the Rocky Place", which if you've been to Scotland you may know there are almost as many Glen-of-the-Rocky-Places as there are sheep. With such an imaginative name, it was unsurprisingly built in the latter half of the 20th century. In fact, next year will be its 50th anniversary. But don't be surprised if the owners won't release anything to mark the occasion since The Chivas Bros would rather no one know about Glenallachie, judging by the effort they put into its non-existent official range. But Chivas/Pernod didn't build the distillery, rather it was Scottish & Newcastle Breweries. Yep, the makers of the ubiquitous brown ale. And, in one more piece of random trivia, Glenallachie distillery received two of Caperdonich's washbacks after that Speyside distillery closed. On to the whisky. This is the fourth little number from that fun mini set I busted open for this double birthday booze week. Two out of three have been very good. How about this one? Its color is the lightest of the bunch, almost clear. The nose is all new make, ultra sugary, almost white rum. Then some orange oil sneaks out, honey, whole wheat bread, and corn flakes. Finally honey mustard and Belgian witbier. The palate is hot, bready, yeasty. A sizable melting plastic note floats above sugar, salt, and chewed grass. It's a little minerally, metallic, and bitter. A combo of notebook paper and sour beer. It finishes slightly buttery and metallic. Hay and sour beer. Maybe this needs water or something. The nose holds onto the honey mustard note. It's more herbal now, more barley focused too. Lemon juice. Breakfast cereal box. The palate remains mineral, metallic, and bitter. There's a moderate sweetness to it, and it stays grassy. Maybe a hint of earth and synthetic oil. Still, it's an improvement. Unfortunately (or fortunately? ), the finish is neutered. Just lightly bitter and earthy at first, growing spicier with time. There was a marked improvement once water was added, as in a markup from a D- to a C-. But if you don't like a mineral and grass filled whisky then this would probably be a big F in your book. While at times seeming near clearac, this whisky isn't totally free of oak influence. I think a really crappy barrel was responsible for the palate problems. A barrel can only be used so many times before the felled tree gets its revenge by pinching an afterlife loaf right into the whisky. That's a scientific fact right there.